If you’re considering adopting a pet hamster, you’re probably wondering how long they live. Will you have to commit to keeping your new furry friend for 15 to 20 years like other common pets, or only for a year or two? On average, pet hamsters live for 2-3 years. However, out of pet hamsters, the Roborovski hamster lives the longest, with a lifespan of up to 3.5 years. Now that you know what’s the potential lifespan of your little fur buddy, consider the implications. You can actually affect how long your hammy’s going to live by taking the best possible care of him or her. 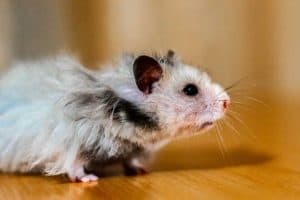 In this post, we’ll go into more detail about how long hamsters can live and also give you some tips on how to make sure yours makes it to a ripe old age. It’s always good to consider the lifespan of a pet, especially when there are children involved. Each hamster breed or species has a different lifespan, and it all depends on where they live, how well they’re taken care of, and if they have any predators. Syrian Hamster: Also known as the Golden Hamster. This is the most common domesticated hamster breed. They are a golden brown, and range from 4.9 to 6.9 inches. They can live between 2 to 3 years. Campbell’s Russian Dwarf Hamster: Also known as the Russian Dwarf, and they can live from 1.5 to 3 years. Their coats can be normal, satin, wavy, and rex and their length can range from 3.9 to 4.7 inches. Native to Asia and North East China. Winter White Russian Dwarf: Also known as the Djungarian Hamster, this hamster can live up to 2 years and the length can vary between 3-4 inches. They are known for their fur, which can be a brownish grey or a bluish grey during the summer, but molts into a white coat in the winter. Native to Siberia, Mongolia, and Kazakhstan. Chinese Hamster: Also known as the Rat Hamster, this hamster can live from 2 to 3 years. They are 3.9 to 4.7 inches in length, and they have a long thin build with a long tail. Their fur is a greyish brown and they have a dark stripe down their spine. They are native to Northern China and Mongolia. Roborovski Hamster: This hamster can live up to 3.5 years, and they can be from 1.8 to 2 inches. They have a golden back and white underbelly, and are native to the Gobi Desert, Mongolia, and China. According to a survey in the hamster owners forum Hamster Hideout, the average lifespan of the pet hamster is actually a bit shorter. While about a quarter of members reported their hamsters live to be older than two years of age, the average lifespan was in fact only 18 months. Only very few hamsters made it past their third birthday. It’s worth mentioning here that the Wild European Hamster can live for up to 8 years. It is a different species from common pet hamsters, mentioned here as an interesting trivia bit. 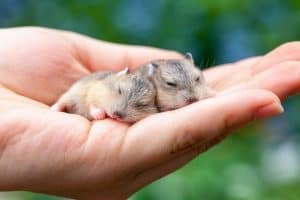 With that in mind, let’s take a look at some things you can do as a hamster owner to make sure your cute little rodent enjoys a long and happy life. How can I make my hamster live longer? In order to help your hamster live longer and live a better quality of life, there are a few things you should do. First off, hamsters have teeth that are always growing. 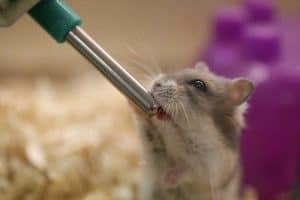 It’s a good idea to put things in their environment for them to chew on, because hamsters trim down their teeth by chewing. If you don’t provide them with sticks or recommended chewy treats, they may chew on the bars of the cage, or plastic within their environment. This can lead to them damaging their teeth, which can cause problems. A healthy diet is essential, and can aid the life of a hamster. Given a daily diet of suitable vegetables, mixed with sunflower seeds, oats, corn, barley, and wheat, hamsters can live a healthy life. However, too many vegetables can be detrimental to their health. Too much calcium, fats, phosphorous, sugar, salt, and water can be harmful to their health as well. Hamsters also need a constant supply of water, for whenever they get thirsty. Bottled water and tap water are both fine, just be sure that you never give them flavored or sparkling water. If you’re keeping a Syrian or Teddy Bear hamster, make sure you only one hamster per cage. They are not social creatures and tend to only look for company during the mating time or when a female is with her little ones. Having multiple hamsters is fine, but keeping Syrians in the same cage together can result in fights and, in many cases, fatalities. Don’t be fooled by the fact that Syrian hamsters are kept together in cages in the pet store. These are often very young hamsters, that are not yet sexually mature and fully territorial. And when they are that – they do fight and kill each other. Overall, the conditions in the pet store is not something you want to have for your precious pet. Make sure your hamster gets plenty of exercise, as it’s vital to their health. They love to run, as it’s part of their nature. You can help with this by providing them with a large enough cage to run around. Make sure there’s a hamster wheel/spinner or saucer where they can run to their little heart’s content. Do get your hamster out occasionally. It’s very important to keep your hamsters’ cage clean. Feces can easily build up, and this can attract bacteria, along with an unpleasant odor. The hamsters bedding should be cleaned every week. How often to clean the cage depends on its size. Choose a large spacious cage for your hamster’s overall well-being and you’ll be able to clean it only once every several weeks. There are two ways that this can be done: by soaking the entire cage in hot water and bleach for 24 hours, and by using pet-friendly disinfectants. If you are using the bleach method, the cage has to soak for another 24 hours in hot water to remove all of the bleach. Wet tail is a relatively common hamster disease found in the intestines, caused by bacteria. The main symptom is a literal wet tail, usually matted with feces. Other symptoms could be lethargy, a lack of appetite, excessive sleeping, folded ears, and a foul odor. Without treatment by a veterinarian within the first 24 to 48 hours, this can kill your hamster. Try to avoid your hamster getting wet tail. Wet tail disease can be caused by poor hygiene, overfeeding of vegetables, stress, and water of poor quality. Your hamster can be stressed because of too much handling, a change in their diet, being away from close family, illness or death of their mate, or a change in their environment. Some of these factors can be avoided, and thus wet tail can be avoided. If you can, also try to avoid your hamster getting diarrhea. They can get it from a virus, too many greens or foods with laxative agents, poor living conditions, or being stressed. The hamster’s feces will become softer, lighter, and watery, and the hamster itself will look sick and lethargic. They may also lose weight. A trip to the vet is a fix for it, but waiting too long can cause your hamster to be uncomfortable longer. Lastly, spend time with your hamster. By doing this, you can get a sense of how your hamster acts and reacts, and you will also be able to notice whenever something is wrong or different about them. It will also help you build a better relationship with them. How long do hamsters live compared to other pets? The sad news is that, compared to other pets, hamsters don’t live very long. However, they do well as far as rodents go. Hamsters actually live longer than mice and rats, who only live 1 to 2 years. Small lizards and guinea pigs are the closest to the hamster’s lifespan, with their minimum lifespan being 3 years. Dogs, man’s best friend, have an average lifespan of 8 to 13 years, though they have been known to live much longer. Indoor cats can can live up to 18 years and, because outside forces, outdoor cats only average to around 5 years. Parrots are the longest living of the three, with a lifespan of up to 50 years (and longer with some breeds! ), making them the pet with the longest lifespan on this list. Before getting a hamster, it’s good to do some research. Some are very small and fragile, and aren’t recommended for smaller children. Be sure to take the necessary steps and precautions to ensure that your hamster has a healthy and comfortable life. Remember, it’s not just the length of your pet’s life that matters – it’s the quality of life you provide your little friend that counts. Take good care of your hamster and you’ll have a great friendship to treasure forever.